This job provides a means of supporting a junior scholar researching part-time who would like to invest in publication in the Late Antique Archaeology series. With a good first degree in History or Archaeology, or equivalent professional experience, you will have good knowledge of academic referencing and abbreviation. Experience of organising conferences and working with publishers are essential to the role. In addition, it is critical that the successful candidate has the demonstrable ability to communicate clearly in written prose and orally with authors, publishers and conference delegates. This job, permitted by a donation, is being created in order to support the work of Dr Luke Lavan with digitising and data entry work, in preparing the excavations of Ostia, port of Rome for publication. With a GCSE in English or equivalent professional experience, you will have experience of digitising archaeological plans to a publication standard. Experience of managing an archaeological archive and knowledge of Harris Matrix and Archaeological reports are essential to the role. In addition, it is critical that the successful candidate has full proficiency in Adobe Illustrator. The University of Kent is carrying out a final season of excavation and survey in the central area of Ostia, Port of Rome, directed by Luke Lavan, as part of the Kent-Berlin Ostia Project. Work focuses on the survey, cleaning and excavation of a public square, an exedra of shops and a nymphaeum: all of late Roman date. We have also studied the transformation of a bath palaestra into a second public square, including the erection of a very late temple. Our site contains early medieval archaeology (house remains and bone dumps), as well as mid-Roman rubbish deposits. The late antique layers are very thin and challenging to excavate. Experienced diggers of 18 years or over are welcome to apply to join our team, on payment of 100 GBP per week for field participation. This payment would cover accommodation, breakfast and lunch. Graduate students studying late antique archaeology would be especially welcome. Because of the exceptionally high cost of staying in Rome, accommodation will be in tents in a well-equipped modern campsite. If you are interested in applying for a place please send your CV pasted into an email (not in attachment) to the following email (l.a.lavan at kent.ac.uk). The closing date is Friday 30th June. A new archaeological research project at the University will reconstruct urban life in cities such as Constantinople during a period of history that has long remained hidden from view. 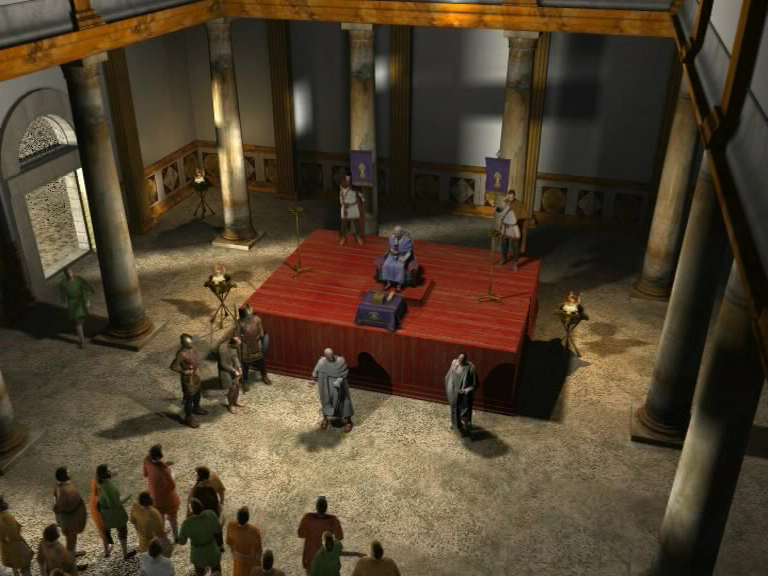 Reconstructions of daily life in ancient Roman cities such as Pompeii are plentiful, thanks to centuries of archaeological research. But that is not the case for the later Roman or ‘late antique’ period (AD 300-650) that saw the long transition from the Roman Empire to the Middle Ages. This is set to change now, thanks to three-year project that will see the University’s Dr Luke Lavan, a lecturer in archaeology, leading a team studying artwork, excavated artefacts and the ruins of ancient cities from around the Mediterranean. The project, ‘Visualising the Late Antique City’, is being funded by a £180k Research Project Grant from the Leverhulme Trust. Although Constantinople is now obscured by modern development within what is now Istanbul, other sites in Turkey, Tunisia, and Italy are expected to reveal much of the urban landscape of the period. ‘Few films or TV programmes seek to visualize everyday life in late antiquity. Most people simply cannot imagine the Mediterranean cities of this period, such as Carthage as known to Augustine, Jerusalem as known to Mohammed, or Constantinople as known to Justinian,’ said Dr Lavan. ‘This was a critical period in the development of European civilization, yet it is remarkable how little is known about the daily rhythms of city life. When most people close their eyes they can probably imagine urban life from earlier periods, in places like Rome or Pompeii, but that is not the case for late antiquity. Dr Lavan, of the Department of Classical and Archaeological Studies at the University’s School of European Culture and Languages, said that in many cases excavations of late antique sites revealed well-preserved evidence. This is because the period formed the final layer on most sites before they were abandoned. ‘Buildings often survive intact to their roof-line, with internal fittings such as ovens, cupboards and shop-counters. Statue bases can also survive in situ on public squares, while pavement markings, along with graffiti and minor official notices, reveal the locations of market stalls or political meetings,’ he added. It is expected that the research, which will published as both scholarly tome and an illustrated catalogue, will help film-makers, popular authors and museums produce better reconstructions of city life in late antiquity, and thus make the period more accessible to a wider public. Peter Talloen (Kent) The Christianization of Pisidia. All lectures will be held on the Canterbury Campus of the University of Kent. backup of data. The post holder will work closely with Dr Luke Lavan. files. v) Back up copies of the data. spreadsheets to monitor and track workflows. themes, from cities and political life to medicine and dress. not accept CVs for this post. Thanks to a grant from the Leverhulme Trust, the University of Kent is able to offer three full 3-year PhD scholarships beginning May 2011, on The Visualisation of the Late Antique City, as part of a research project led by Dr Luke Lavan and Dr Ellen Swift. Our research will aim to establish an academic basis for reconstructions of everyday life in Mediterranean cities of this period, through both synthetic writing and detailed case studies of specific archaeological sites. All three doctorates will be jointly supervised by LL and ES. Sources will be both archaeological, artistic and textual, and will be used to build a shared database on everyday life, which will be used by LL and ES in conjunction with a historical illustrator to produce colour images of urban scenes in selected cities. On completion of the project, the doctoral theses will be prepared for publication in a monograph series and will also contribute to a collective volume on Everyday Life in the Late Antique City. Applicants should have a first class or 2i degree or equivalent and an established interest in late antique archaeology. International candidates are welcome. An MA degree (merit or distinction) would be an advantage, as would practical experience of archaeological fieldwork / museums, and knowledge of one or more modern European languages (French, German and Italian). A commitment to meeting deadlines and working within a team is essential, as the project will only achieve its full potential if outputs are delivered on time and a collaborative ethos is maintained. A tax-free scholarship will be provided for three years, to cover fees for at Home/EU level and to provide a living allowance of 13,000 GBP. Research expenses to cover foreign travel for the project will also be covered. The deadline for submissions is 20th February 2011. Selection will be based on written submissions, with the option of interview by telephone / email. This thesis puts people centre-stage in our reconstructions of cities. Whilst the dress of upper social classes is well-known, that of the middling and lower classes is not, and we have little idea of regional variations in dress. Similarly, hairstyles or beards from court are well-studied, whilst the personal appearance of shopkeepers, beggars, children and slaves is somewhat neglected. Indeed, recent reconstructions of dress have produced idealised depictions based on mosaics, manuscripts and statues, of people looking their best. We have little idea of how clothes aged, were repaired, or how they might vary seasonally. To make progress we need to understand the nature of personal representation in late antiquity. We also need to consider often neglect textiles, especially from newly-excavated Egyptian graves, along with evidence from patristic texts and depictions, to reveal seasonality, wear and repair in dress, alongside evidence of bodily modification, such as piercings or tattoos. This material could provide a basis for filling city reconstructions with credible ordinary people. Although the decoration of monumental structures, especially churches, is relatively well-synthesised, this is not true of street porticoes, shops, workshops, and ordinary houses. In order to produce convincing urban images, we need to consider not only major public structures, but also in-between spaces. It is also necessary to have an idea of how such decoration, which might not attract as great an investment as public buildings, aged, weathered, and was repaired. The art work of research associate SR has made extensive use of such ideas. However, the empirical data to support this academically has not been collected. The thesis will compile a gazetteer of dated examples of decoration for porticoes, modest houses, shops, workshops and small churches, with a thematic chapter on each, illustrated by a case study. The study will also consider evidence for light fittings, shutters, textile hangings etc, which might have modified the appearance of structures. The student will be trained in the recognition of decorative traces by SR and ES, before joining LL in visits to sites selected for reconstruction. This thesis will study the everyday arrangement and use of artefacts within selected urban settings, especially drawing on the rich occupation deposits revealed by Eastern excavations, which have had little synthetic or critical treatment. The student will reconstruct theoretical groups of objects for shops, houses and ordinary churches, and try to establish the functional connections between objects (their use). This will allow us to ‘furnish’ architectural illustrations and understand behaviour in each setting. The study will consider object groups from published occupation deposits, as well as those in depictions, inventories, and groups hypothesised from functional artefact studies. These sources will be both analysed on their own terms and compared for their value for studying object use in churches, houses and shops. Although the topic seems vast, the sources limit inquiry: for shops, we can so far only reconstruct object groups for restaurants, metal workshops, glassblowers and cloth-dyers. Applicants should have some experience of teaching and an established interest in late antiquity or Roman cities. A good MA degree or equivalent is required. International candidates are welcome. Knowledge of one or more modern European languages (French, German and Italian) would be an advantage. Candidates must submit a successful PhD application, pertinent to Late Antique Archaeology or other work of the Centre. A tax-free scholarship of 12,500 GBP will be offered, to cover fees for one year at Home/EU level of 3,800 GBP and to provide a living allowance of 8,700 GBP. Further postgraduate scholarships are available within SECL, which the successful candidate would be invited to apply for. Applications should consist of a CV, covering letter and research proposal (one side of A4) and an example of written work, made by email to postgraduate secretary Juliette Ashby: J.C.Ashby@kent.ac.uk. To apply on-line for the PhD visit http://www.kent.ac.uk/studying/postgrad/apply/ The deadline for submissions is 30th November 2010. Selection will be based on written submissions, with the option of interview by telephone / email. A one day workshop of the Universities of Kent and London (King’s College) to be held at King’s College, London on Saturday June 26th. 11.00-11.30 Ardle MacMahon (OU) Sources for shop interiors: the early empire and late antiquity compared. Room details: Room B6, at King’s College (Strand Campus), the Strand, London, WC2R 2LS. Tube station: Temple. Studies of the late antique economy often stress sea-borne interregional trade as a motor of prosperity. But why were inland regions able to flower at this time? Was wealth generated mainly by local production and exchange? How important was this to the economy as a whole? Rural production dynamics: autarchy, tax and forms of exchange, seen from papyri. Specialisation in artisanal production: what does it mean for local exchange? 10.40-11.10 Kim Bowes (Cornell) Spain and Gaul. 11.10-11.40 Emanuele Vaccaro (Cambridge) Interior Sicily. 11.50-12.20 Lynda Mulvin (Dublin) Pannonia. 12.20-12.50 Elizabeth Fentress (UCL) Numidia. 14.00-14.30 David Mattingly (Leicester) Garamantia. 14.30-15.00 Hannelore Van Haeverbeke (Burdur) Pisidia and Lacaonia.